Yelena Isinbayeva has competed on a level all to herself for the past three seasons. That could change on Friday at the Golden Gala meet. The Russian pole vault world record-holder will go up against Jennifer Stuczynski for the first time since the American cleared 4.88 meters on June 2 - tying Stuczynski with former world record-holder Svetlana Feofanova for second best all time. "It's good that Jen jumped 4.88 because that motivated me, that got me angry. It's given me a challenge," Isinbayeva said. "It's been the motivation and anger which has been missing in my jumping." That anger was on hand last week when Isinbayeva set a season's best of 4.91 at the previous Golden League meet in Paris. Still, she failed on three attempts to add a centimeter to her world record of 5.01. A week earlier, Isinbayeva won with only a 4.66 in Ostrava, Czech Republic. "I love to win of course but when you win every time you lose your appetite," Isinbayeva said, according to the IAAF Web site. "It's like someone who loves to eat chocolate and eats it every day and eventually you have so much that you hate it. "I now have got that hunger again. I am hungry to compete with (Stuczynski)." Isinbayeva has improved the world record 20 times, but not since establishing 5.01 at the worlds in Helsinki, Finland in 2005. Feofanova will also be on hand on Friday at Stadio Olimpico. The last time Isinbayeva and Stuczynski competed against each other was at the Millrose Games in New York in February. 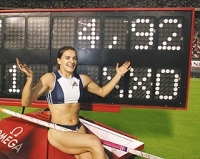 Isinbayeva won with a 4.82 to 4.53 for Stuczynski, a former basketball player who has been pole vaulting only since 2004. Isinbayeva is also one of four athletes still in the running for the Golden League jackpot of US$1 million (EUR730,000) - awarded to competitors who win their event in each of the series' six meets. Tero Pitkamaki of Finland (javelin) and Americans Michelle Perry (100 hurdles) and Sanya Richards (400 meters) have also won all of their events so far. Richards set a season's best time of 49.52 seconds in Paris. The jackpot has become her top goal this season after failing to qualify in the 400 for next month's world championships in Osaka, Japan by finishing fourth in the U.S. trials last month. That ended her run of 18 consecutive outdoor victories since finishing runner-up at the 2005 worlds. Also of interest on Friday will be the appearance of double-amputee sprinter Oscar Pistorius in the second-tier "B" 400-meter race. Pistorius, who races on carbon fiber blades attached below his knees, is warming up for his world-class able-bodied race debut on Sunday in Sheffield, England. Pistorius was given permission to race in able-bodied races by the International Association of Athletics Federations last month, but still faces a barrier to take the step up to Olympic level amid claims the curved blades he runs on create an unfair advantage. The IAAF will reportedly film his race on Friday for study purposes. World record-holder Asafa Powell is slated to run the 100 for the first time since a groin injury. He warmed up by anchoring Jamaica to victory in the 400 relay in Lausanne, Switzerland on Tuesday. Powell's strongest competition should come from Derrick Atkins of the Bahamas, who won in Paris and Lausanne. Torri Edwards, winner at the U.S. trials, Paris and Lausanne, is the favorite in the women's 100. World 400 hurdles champion Bershawn Jackson was also entered. Virtually all the Ethiopian long-distance runners, led by women's 5,000 meter world-record holder Meseret Defar, were late withdrawals because they have been called up by the national federation to compete in the African Games. The event started Wednesday in Algeria and runs until July 23.